GB DUO LIVE this SUNDAY! The GB DUO is making its debut this SUNDAY, JAN 14, 5-7pm at the Tranzac Club in Toronto. 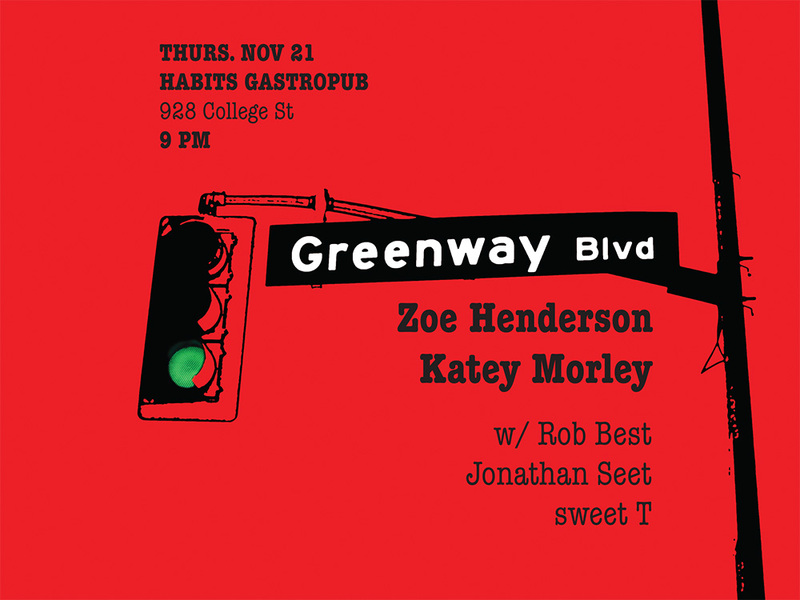 Rob Greenway & Cam MacInnes will be playing some songs from the Greenway Blvd and brilliantfish catalogues in an intimate setting. This is part of the series “More Songs & Poems” hosted by Max Layton & Robert Priest. Over the years, I have had the honour of playing with some of the finest musicians around. One of these wonderful people is the incomparable Cam MacInnes. 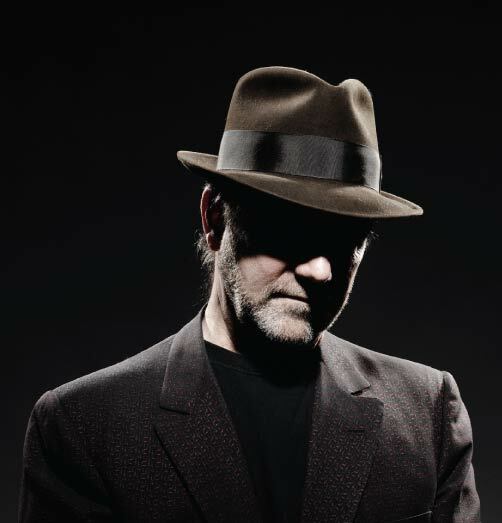 An exceptional guitarist, composer and producer, Cam’s work is always captivating, inspiring and often extremely moving. He has worked with artists such as Drastic Measures, RaRu, Perfect World, Lee Whalen, Mary Jo Eustace, Gayle Ackroyd, Melanie Doane, Melody Ranch and Besharah. He is half the composing team with Bill Colgate in the band Cadre, and the “third member of the duo” Hush & Rust. 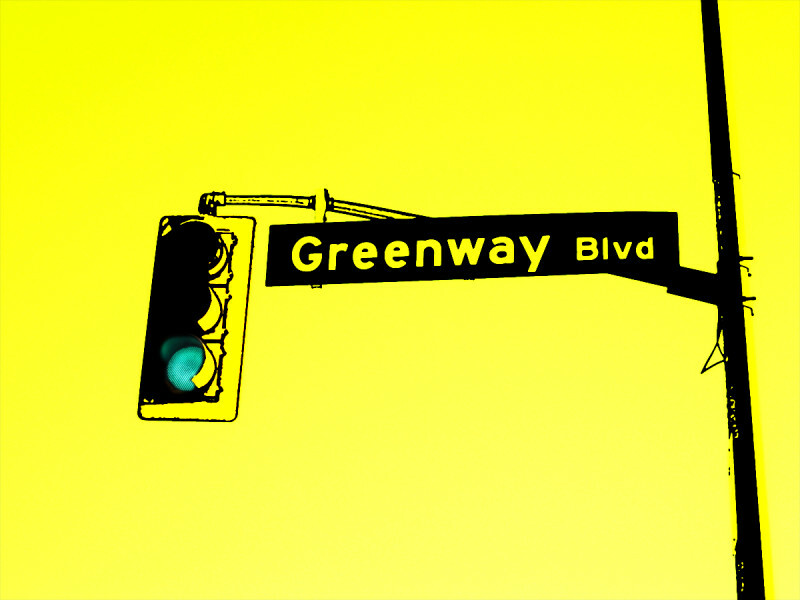 Now, I introduce the GREENWAY BLVD DUO: Rob Greenway & Cam MacInnes. Drawing from the GB and brilliantfish catalogues, we are stripping the songs down to their essence, often re-imagining them entirely, in an intimate guitar/piano/vocal setting. Our first gig is JANUARY 14 at The Tranzac in Toronto. The front room at The Tranzac is a wonderfully intimate listening space and a perfect debut for the Greenway Blvd Duo. 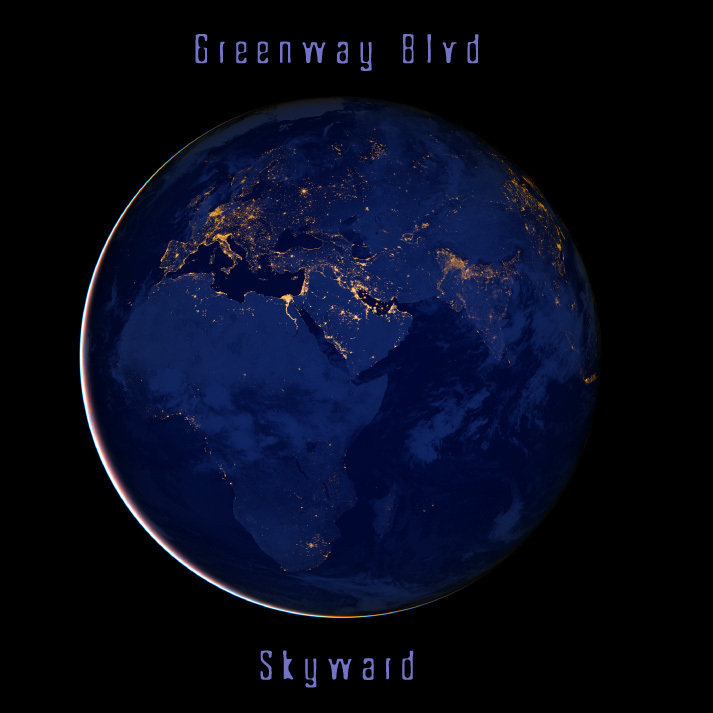 i’ve been working on SO many things all at once, but the upcoming album ‘skyward’ will be released next year. that image takes my breath away. all of our little lives, all bunched together in tiny lighted enclaves… seen from space, we are so heartbreakingly small. the themes of most of the songs involve the concept of space – inner, outer, metaphorical, imagined, the sky above us, the sky below us – and how we either relate to it, or how it shapes us. so, i want to take care to get them right. 1 1/2 years between posts? Not a great way to keep my fans interested, is it? I am truly sorry (see pic). But there have been all kinds of OTHER projects happening and, well, you know…. LIFE. I am working on the next GB record, ‘skyward’ and it’s sounding great! I am also playing in several local bands and trying to find work. BUT: NO MORE EXCUSES! Plans are in the works for a full-on Blvd Band! So I definitely will keep you posted. Welcome to the new lemon-scented fresh website! Spent today and rebuilt the website. Not that i needed or even wanted to rebuild the website, but the developer of the previous WordPress theme is an idiot and won’t support his products. The upside is, the folks at Audiotheme just made this new theme and it’s beautiful. Minimal, stylish… all the things i like. There’s a new music player at the bottom of the site for easy listening (no pun intended) and all the sections are streamlined and gimmick-free. Poke around and enjoy! The title song from my upcoming album, ‘Skyward’. Recorded live @ C’est What with the wonderful boys of CADRE (whom i play drums with every 2 weeks here in Toronto). Many thanks to Cadre’s own Joey Gaitanis for mixing and editing this! 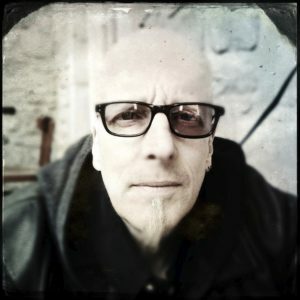 working on 2 new GB albums! no, it’s not enough to do just ONE. the songs for ‘Skyward’ are nearing completion, and the latest tenants on the Blvd are a few songs with a very dream-like roots vibe. this could be my ‘Sea Change’…. who knows? from our set @ C’est What, Toronto last sunday afternoon. HUGE thanks to Randall Cook for shooting and posting this vid! Mr. Blvd with (from left to right) Rob Best, Derek Christie, Jon James & Jonathan Seet. can’t do it without them! 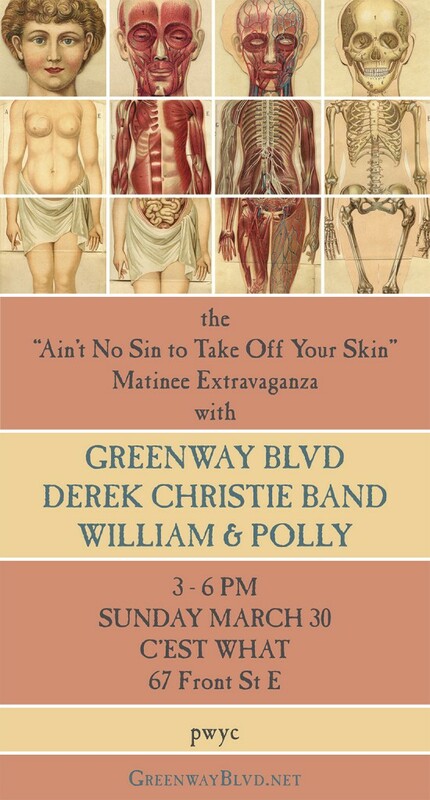 The “Ain’t No Sin to Take Off Your Skin” Matinee Extravaganza! Our good friends CADRE offered us 2 of their residency Sundays @ C’EST WHAT and we couldn’t say no. We have invited more friends to join us, and it’s going to be a great couple of afternoons in the cozy underground den. w/ GREENWAY BLVD, DEREK CHRISTIE BAND and WILLIAM & POLLY. 3 sets with a bunch of awesome people including Rob Best, Jonathan Seet, sweet T, Jon James, Howard Stern, Steve Frise and Boris ‘The Keys’ Paillard. GREAT MUSIC, GREAT SPACE, GREAT SOUND and a fantastic beverage selection. as part of the Piano Series @ Habits. Mr. Blvd will once again be flanked by Rob Best on keys & vox, Jonathan Seet on guitar & vox and guest vox by sweet T.
This will be your last chance to catch Greenway Blvd in a public venue until 2015! 2014 is going to be a year filled with more intimate house/loft concerts with a growing collective of wonderful artists.